I left my 2005 R1200ST in Denver last November and I have to go pick it up in the spring (poor me :-)) I have a ticket to fly to Denver in June and had planned to just drive it back to Ottawa Canada, but it is my 20th anniversary this year and my wife is thinking about trying something new. You see, she is afraid to ride on my bike (granted, she only has experience in town where the cages are erratic). I asked her if she wanted to take the trip with me (expecting to hear a quick "no"), but heard "maybe I'll go for part of it". We're thinking about spending about a week together on the bike (hotel stays), and the plan is for her to fly to Phoenix where I will meet her. Possibly see the Grand Canyon and slowly meander back to Denver. I need to find roads that are beautiful and scenic, and take us to places where we can get off and stretch out legs (perhaps even spend a day seeing more beautiful sites). I love switchbacks, but I'm not sure that my wife would appreciate them at this juncture, and I don't think that interstates are the answer either. I want this trip to be special for her, especially since she is only taking this trip because motorcycle touring is something that I love. Please BMW community, Offer me up some great places and roads to take her to, that will make her want to ride and do more. I'd start with this rough route: Grand Canyon, Mesa Verde, Black Canyon of the Gunnison National Parks. The Grand Canyon in June may be overcrowded, but if you've never been there, you don't want to miss it. The other two parks are on your way. Mesa Verde deserves at least a day, the Black Canyon is impressive but might take only a half day unless you like to hike. (It also might suffer in comparison to the Grand.) Stay off the interstates as much as practical, the two lane highways in the area are not crowded and are much more interesting. US 550 from Durango is great riding with gorgeous scenery. Actually, it's all great scenery in that area. Spread over 5-6 days, the 1000 miles should not be too hard on your wife. If she is enjoying the ride and you are making good time, it would be easy to add some short hikes and more mountain miles in Colorado. If it is not working for her, be willing to bee line it for Denver. Realize that having requested planning advice, your are now obligated to provide a trip report! Colorado only has the two interstates highways and just about all the other roads and places are interesting to me. I live in Salida CO. Instead of giving you a route I will give you places of interest for you to Google and decide for yourself. Hotsprings are all all over the state and many have lodging. Mt Princeton is the only one I have been too and it seems very popular. Ouray (coming from the south on 550 is spectacular) is a quaint little town often referred to the Switzerland of the Rockies. Also with a hot spring not as nice as MT Princeton. You can rent a Jeep and see some amazing terrain and some well preserved ghost towns. The Durango train ride is special cause you can see part of the back country that you can’t see from the roads. Gateway is VERY nice with a spectacular car museum and resort founded and financed by the owner of the Discovery Channel. Any time you are on the west side of Colorado you won’t be far from Moab Utah. Telluride is fun in the summer and the gondolas run all day with no charge so you can ride up to the top of the mountain and have lunch. The road south from Telluride can take you to the Anasazi Indian village remains. Lake City is fun and the road to get there is even better. Salida is where you will find the cheapest place to stay that usually comes with dinner and breakfast. My house. You could go rafting on the Arkansas or borrow my gear and go fishing, play golf, bike ride, visit our many art galleries or just watch the sunset from my deck. See Whip’s Colorado in [Riders Discuss Other Topics]. 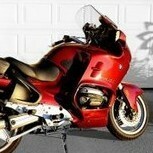 I and gonna be gone for the second half of June riding to the east coast. Independence Pass has a great viewing platform and will take you to Aspen. Cottonwood Pass (now paved) to Crested Butte. Leadville boasts being the highest city in the US. Rocky Mountain National Forest has a nice ride through it. Garden of the Gods is beautiful. The nicest thing about Denver is it is only 30 minutes from Colorado so get out of there and stay out of there as soon as you can. Follow any road next to a river or that crosses any mountain. the plan is for her to fly to Phoenix where I will meet her. Best way to get to Phoenix from Flagstaff. Lake Mary road is great and the rest coming down through Pine and eventually to Phx is very nice also. 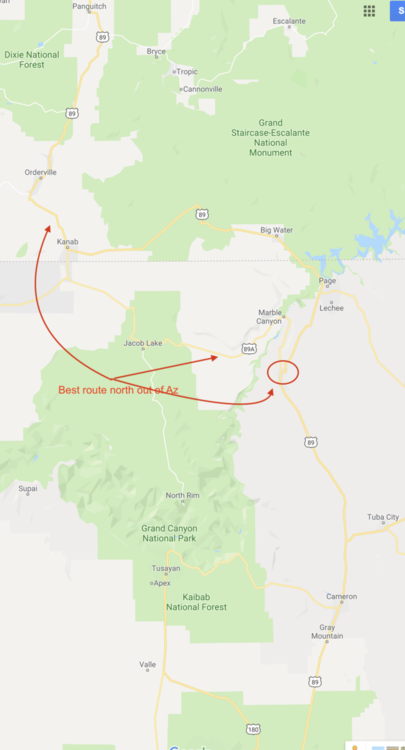 Coming back out of Phoenix north to Flag and other points north, I17 is really a very nice road and I wouldn't discount it just 'cause its a major highway. Lots of scenery ... its not a boring straight highway! 199 from Morenci to Springerville. Especially if she ever read any Louis La'mour. Go through Jerome then Sedona to Grand Canyon, then scoot up to Torrey via 89 and 12. Do not miss 12. UT 72 to UT 10 to Huntington, then up Huntington Canyon 31 to 264/96, then up towards Duschene on 191 (or the new road through 9 mile canyon completed after I moved away 6-years ago) and from there 35 through Francis to Kamas and 150 to Evanston then I-70 to Ft Bridger and down to Vernal from Vernal to Craig, then up to Baggs and over to Laramie, then 14 into Ft Collins, or Rocky Mtn NP. Thanks for all of this, and especially for the invitation Whip, which I am going to have to decline because the entire trip will take place in the second half of June. I hope that you have a great time going to the east coast. Wife just told me that she wants me to choose a couple of places to spend a few days. We have been to Mesa Verde (loved it, everyone should go if they get a chance) I had thought of Black Canyon of the Gunnison and Antelope Canyon, Moab, Aspen. I will check out your list Whip, maybe there is something there that will capture her imagination. Will definitely try your road suggestions Chris. Still open to advice and will post a trip report. Thanks Twisties. I will look into those roads. They will probably help us winnow this thing down (Wife smiled BIG TIME when I read the word "Sedona" out loud). I'm not a huge fan of Sedona, but my mother loved it. Other than hiking, which will be too hot in June, the one thing I did like there is Tlaquepaque. I haven't yet found much of interest at Black Canyon, but strongly recommend Moab area... although expect dry heat... 10-20% humidity and possibly over 100 F at that time of year... too hot for hiking. You might consider staying at higher elevations... Grand Canyon, Torrey, Jerome, Anywhere in CO except along 141/Gateway although the museum is special... No matter how you do this, coming from phx you will encounter some significant heat. Update: Plans have changed somewhat, as my wife is now flying to Denver with me instead of meeting me in Phoenix. The bike is in Denver, so that will be the start and end points for her (I will be riding back to Ottawa after dropping her at the Denver Airport hopefully with a smile on her face and great motorcycle memories). The plan: Day 1: Drive from Denver to Pagosa Springs, CO. Soak in some hot springs overnight! Day 2: Drive from Pagosa Springs to Page, AZ. I realize that we are passing Mesa Verde, but I took her there (in a cage) on Columbus Day weekend last year. The route is not 100% confirmed, that will depend on how much my wife comes to enjoy the ride, but the stops are confirmed. I will definitely take the time to write about this trip once it is over, but in the mean time, does anyone have advice for restaurants, attractions, tour companies and not-to-miss things to do on this route?. Recommended roads on our route would also be appreciated. Not trying to muddy the waters but if you’re going as far south as Pagossa Springs, take a few more hours to ride and spend the night in Taos, NM. It’s a terrific ride about 150 miles. I love the idea bwpsg, and I know that my wife would love Taos (because she wanted me to go to Santa Fe with her last summer (and I couldn't). THe only problem is that I'm trying to keep total hours per day around 5 hours and Taos to Page is about 7.5 :-(. Thanks for the suggestion though! Black Canyon is wonderful. Hwy 92 to the north rim is a killer road and not as touristy. +1 on Moab...Canyonland and Arches. It will be hot though. Enjoy and take lots of pics. 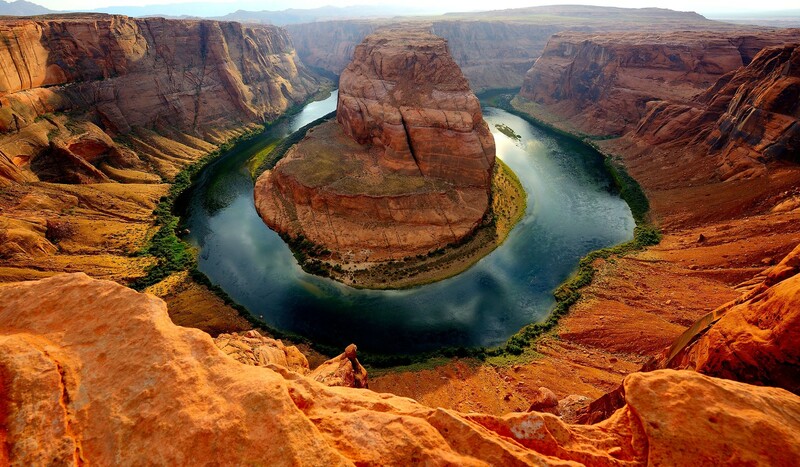 Sound Guy ... if you go to Page, AZ don't miss Horseshoe Bend, it's just south of town. We did a Corvette trip a few summers ago from Michigan to Northern Arizona, Eastern Utah, Colorado and then home. It's about a 20-30 minute hike from the parking lot. with some nice prime rib dinners at the Sunset Grill on the hill overlooking the city.